The Secretary of the Central Committee of the League of Communists of Croatia (Serbo-Croatian: Sekretar Centralnog komiteta Saveza komunista Hrvatske) was the head of the League of Communists of Croatia, heading the Central Committee of the Party. 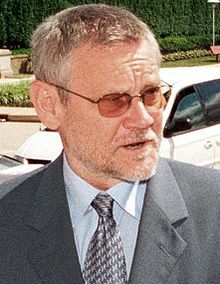 The holder of the office was, for a significant period, the de facto most influential politician in the Socialist Republic of Croatia, a constituent republic of Yugoslavia. The official name of the office was changed in May 1982 from "Secretary of the Central Committee" to President of the Presidency of the Central Committee of the League of Communists of Croatia (Predsjednik Predsjedništva Centralnog komiteta Saveza komunista Hrvatske). The League of Communists of Croatia was also an organization subordinate to the federal-level League of Communists of Yugoslavia. Between August 1937 and September 1952, the former was named the Communist Party of Croatia (being part of the larger Communist Party of Yugoslavia), until both parties were renamed "League of Communists" in 1952. The role was later formalized as holding ex officio positions within both the Presidency of the Socialist Republic of Croatia and the Presidency of the Central Committee of the League of Communists of Yugoslavia. 1941 Executed in Šibenik by Italian occupation authorities during World War II. 1944 Federal State of Croatia formed. 1969 Longest term in office. During his term, in May 1952, the party changed its name from Communist Party of Croatia to League of Communists of Croatia.